Summer is coming…and so is the Summer Arts Market! Once again, Open Culture are taking over the stunning Liverpool Cathedral for Merseyside’s biggest arts and crafts fair and best independent shopping experience. The Summer Arts Market is the only place to pick up beautiful, unique work from the region’s best artists, crafters, designers and makers. In the aisles you’ll find thousands upon thousands of handmade artworks, creative crafts and design gifts from some 200 independent businesses including screen prints, paintings, intricate jewellery, tableware, beauty products, woodwork, colourful decorations, accessories, textiles, photography, knitwear and hand poured candles. All that plus an artisan food fair and vintage fair, and independent clothing designers too! More on those below. Let everyone know you’re coming to this year’s market (and invite your friends too!) over on Facebook. Alongside the art and design on sale, a dedicated Vintage and Clothing Fair will be stocked full of summery vintage fashions and accessories from Liverpool’s best-loved vintage sellers and the Food Fair will feature craft beer and liqueurs, sweet and savoury baked treats, vegan and gluten-free options plus blended teas, artisanal chocolate and preserves. The Craft Lab is back for families to get crafty themselves in a hands-on creative workshop led by the Silly Scientists from KECS Creative. You’ll also be able to pick up lunch in the Cathedral’s Welsford Café, open all day serving a BBQ and other refreshments. 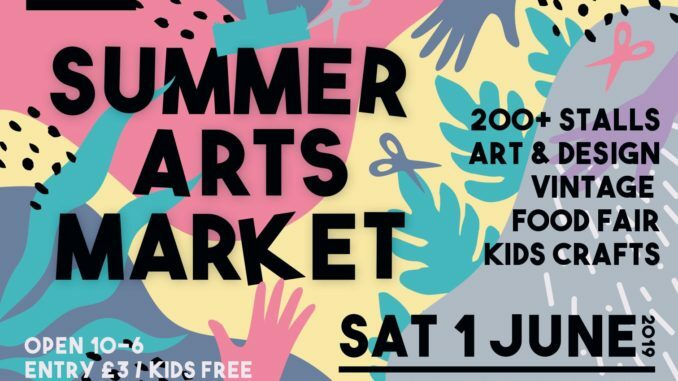 You can see more about this year’s exhibitors at www.summerartsmarket.com – more will be added over the next few weeks so do keep an eye out! Liverpool fashion designer Andrea Mcwha will have a stall selling sustainable children’s clothing from her label Wunderlang made in natural fibres from from locally sourced vintage clothes. South Liverpool’s Artefact Vintage will be selling vintage and retro clothing and accessories galore in the Vintage & Clothing Basement.